My kit has a copyright date of 1977. Heller re-released it again in 1979, 1982, 1994 and the 2000's. I paid a whopping $2.00 for my kit in 77. Of all the fighter planes that flew during WWII, the P-39 was unique in having its motor placed behind the pilot. This design allowed for greater manoevrability. The P-39 was the first single-motor fighter plane to have tricycle undercarraige and to have a more powerful armament than any other single engined fighter of the time. The Airacobra was designed in 1936 and was first ordered by the Army Air Force in 1937. The Airacobra was acquired by several foreign air forces, British, Italian and U.S.S.R. The Free French Air Force received 165 P-39Q/N's between 1943 and 1944 and fitted out two fighter wings. At the end of the war, one P-39 was assigned to flying schools, of which the fighter school of Neknes. Heller is an old prolific model company based in France. They make all manner of model subjects in the popular scales. This kit came in a shrink-wrapped end opening type box. I am no fan of this type of box, because invariably parts or the decal sheet find their ways past one of the end flaps to become lost forever. Give me a tray and lid type box any day of the week. The box art shows 2 P-39Q/N's flying along. The one in the foreground is overall dark green above a grey undercarraige. It has a yellow spinner and the white number 17 on the sides of its nose. It has the yellow serial no. 470919 on the rudder sides and roundels in the normal positions. It has a logo of a white star with a bird flying through it on the car door cockpit entries. The 2nd aircraft is in the same color scheme with a white no. 12 on its nose. It has the yellow serial no. 47091 on the rudder, but the last number is unreadable. Side panels of the box show 5 other box arts of aircraft kits that Heller markets: a French Caudron 714, a Curtiss 75A-3, a Messerschmitt Bf-109K, a Mitsubishi Zero Sen and a Messerschmitt Bf-109F. The length of the model is 12.8 cm and you can do 2 schemes with the kit. This kit contains 3 medium grey trees, a clear tree, the decal sheet, instructions and a sheet of instructions for using a glue capsule that is not in the kit. 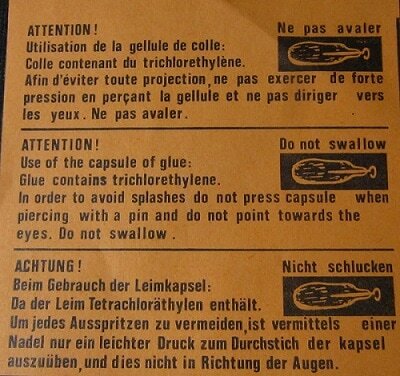 I removed this capsule years ago because I was afraid it would rupture and ruin things. ​The instructions consist of a single sheet printed on both sides in 8 1/2" x 12" page form. 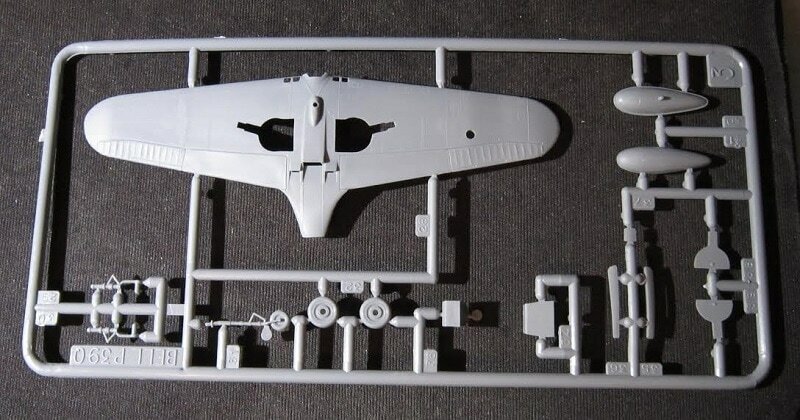 The face side has the history of the P-39Q/N, a list of the parts names, color information, a single exploded drawing for assembly purpose over two 2-views of schemes. 1. The box art scheme (already described above). It is from the French fighter school at Meknes. 2. A P-39Q/N that is olive drab over a grey undercarraige. it has a white band behind the spinner, a white 125 on the sides of the nose, white wing tips and white tail and a black serial no, 219595 on the rudder. It is from the 362nd Fighter Sqdn., California, 1943. A customer service coupon is shown too. The whole side of this sheet is in French. The other side of the sheet repeats all the same stuff, except for the exploded drawing and the 2-views in English and German. The parts trees are not alphabetized or illustrated in the instructions. 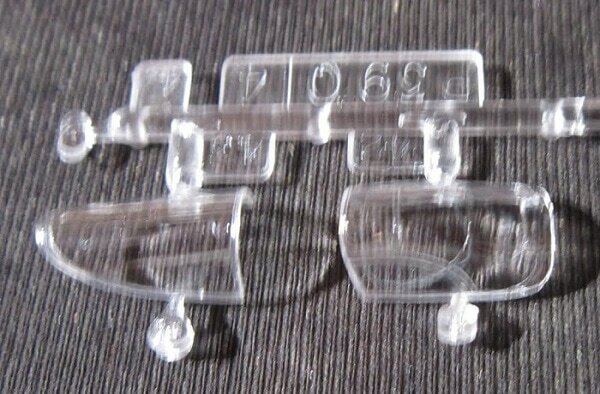 However, they do have number tabs next to the parts on the trees. 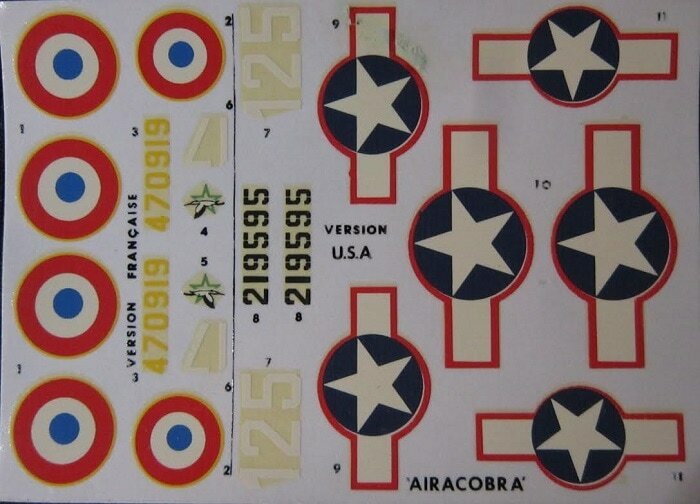 ​The decal sheet and the instruction slip for using the glue ampule complete the kits contents. This is a nice older kit of the Airacobra. I bought my kit back in the 70's very cheaply at my local hobby shop. ​I am willing to sell it for a reasonable offer.